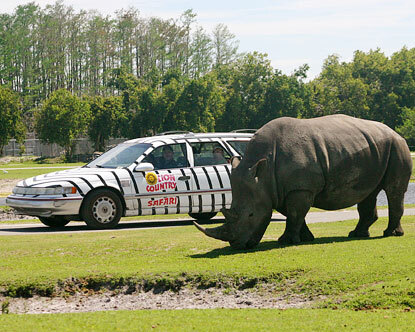 Lion Country Safari near West Palm Beach is one of the best and most unusual Florida tourist attractions. Florida is one the most popular holiday destinations in the world, and with so many famous attractions it is not surprising. The vibrant city of Miami attracts those wanting to party, Fort Lauderdale is a huge base for individuals taking to cruise holidays and boating adventures, and Orlando is one of the biggest family destinations in the entire world due to its theme parks, wildlife centers and multiple Florida tourist attractions. However, there is far more to discover in Florida than just these few well known attractions, and one of these is this fantastic attraction. Established in 1967, Lion Country Safari continues to be a popular, ‘cageless zoo’ attraction, where you are able to drive through a safari park and get up close to nature. The attraction was founded by a group of British and South African individuals who wanted to offer people the chance to experience a safari without having to travel to Africa. The park is now home to more than 1,000 exotic animals and will provide an experience unlike any you've had before. With Florida’s great climate, the Safari is open all year round and is the perfect place for the flora and fauna that call the park home. There are two distinct areas of the safari; that of Lion Country Safari and Safari World, the latter of which is a walk through area of the park where you’ll be able to get out of your vehicle. However, the main draw of this Florida tourist attraction is the ability to drive through exhibits. Here you’ll be able to enjoy giraffe, white rhinos, ostriches, chimps, and even lions up close and personal. Feeding time is normally around 10:30am and is a great time to ensure you’re in the park as you’ll be able to enjoy animals closer than ever. With any drive through this attraction there are a few important rules to keep in mind. First, due to the up close and personal aspect of the attraction, no convertible vehicles are allowed for safety reasons. An animal might rip the top right off. Second, no pets are allowed in cars so it is best to leave your furry family members at home, though kennels are offered for a $5 deposit. Third, you must ensure that there are no articles or possessions strapped to the outside of your vehicle as these are likely to be ripped off by animals. The Safari does offer rental vehicles should you need them, but for the best experience simply sticking to the rules and using your own car is preferable. This is a fantastic and entertaining attraction to visit when you are near West Palm Beach. With five miles of drive-through safari, a summer day camp, animal demonstration theater and more than 1,000 exotic animals to enjoy you’ll come away from the day with a huge smile on your face. And with animals up close and personal you may experience an encounter like never before. The admission fee is $31.50 per person (August 2015), less for children and seniors. Call 561-793-1084, however, for current information on admission fees, operating hours and special events, or visit their website.